Edge of Tomorrow - How Many Times? Edge of Tomorrow brought us a character enveloped in a time loop where he must face an alien enemy in a war the humans simply cannot win. For every death he suffers, he awakens back at a military base in Heathrow Airport, and must then continue his journey again and again. 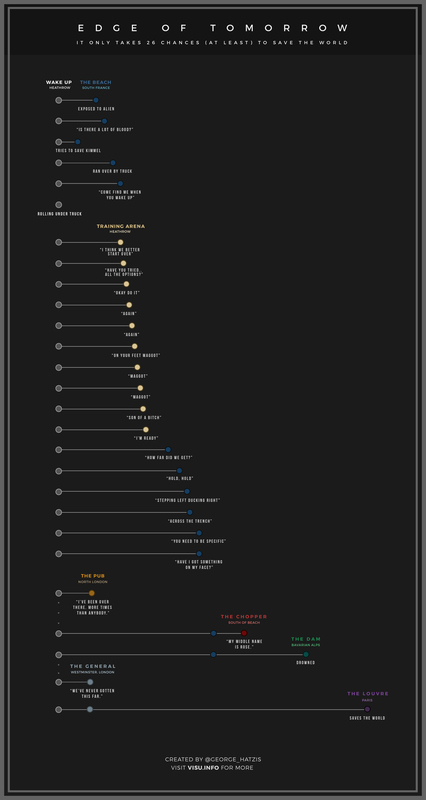 Below is my infographic representing his on-screen death/loop cycle, and while there are many moments that suggest he has died many more times, this encapsulates those that were featured directly on-screen.